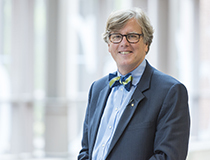 UNCW Watson College of Education Dean Van Dempsey has been elected to serve a two-year term on the board of directors of the Public School Forum of North Carolina. For more than 30 years, the forum has championed for the school children of N.C., linking business, education and policy makers to better shape educators and communities. The university’s Strategic Plan emphasizes excellence in teaching and service and efforts to contribute to the quality of life across the region. A native of Scotland Neck, N.C., Dempsey holds a Ph.D. in social and cultural foundations; a master’s in teaching (social studies education); and a bachelor’s in education from UNC-Chapel Hill. In addition to spending 24 years in higher education in West Virginia, he was a high school social studies teacher in Fayetteville and Pittsboro, N.C. He has served as WCE dean since 2015. In 2017, he was one of 16 individuals appointed to serve on the Professional Educator Preparation and Standards Commission, created by the NC General Assembly. He also served on the WV Board of Education’s Higher Education High Quality Educator Stakeholder Committee and was the recipient of a National Academy of Sciences Board on Children, Families and Youth “Frontiers of Research on Children, Youth and Families” award.